On September 23, CityBench number 1,500 was installed near a middle school in the Bronx. How is this piece of furniture connected to Bryant Park? The CityBench was designed in 2011 by Bryant Park's Vice President of Design, Ignacio Ciocchini, as part of a contest sponsored by the City to create the next great public seating. Ciocchini's design won the competition, and his bench has been adapted by NYC as its standard bench. 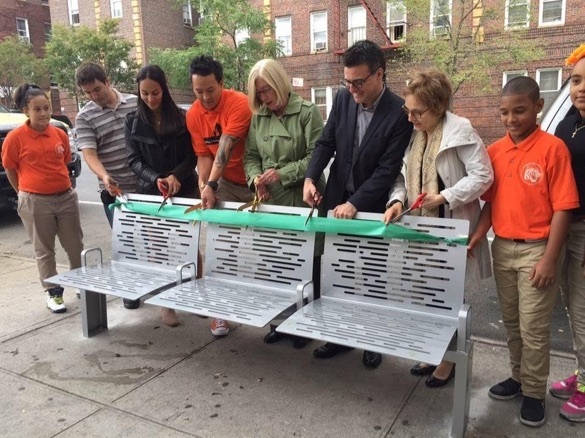 NYC residents bring the benches to their neighborhoods by applying for one, free of charge, from the NYC Department of Transportation. CityBench targets neighborhoods and commercial corridors that do not have enough places to sit. We're sure to see the number of benches rise well above 1,500, as the Federal Transit Authority recnetly announced that the CityBench program has been awarded an additional $1.5 million. Ciocchini, third from the right, cuts the ribbon on the city's 1,500th CityBench. Congratulations to Ciocchini on his design success!